And no, I don't use "Re-generate projects" button, just plain old resync. Also when I open project in protobuild manager for some reason it automatically resyncs and download stuff. Most likely not a bug but something stupid I'm doing, the only question is what exactly? Unfortunately had to use VS as my IDE because I got that debugger error on Xamarin Studio. Please help me. Already file has disappeared from project's hierarchy thanks to this bug (code file) and I fear it will get worse as the project rises in size as I'll eventually have to restore several files. Not to mention my customized build options (mainly containing of ignoring "missing XML comment" warning) have to be restored over and over again. Make sure you "Save All" in Visual Studio before running resync. By default Visual Studio doesn't save project or solution files until you Exit VS, which means when Protobuild goes to read the .csproj for synchronisation, the files you added in Visual Studio aren't there. You said "by default". Is it possible to change this behavior? Package type not specified (and no file at C:\Users\Darkhog\Documents\gamedev\redacted\Protogame\.git), requesting binary version. Unfortunately Visual Studio has no such option. The flag you want on the command line is --resync, not --generate. Generate discards changes made to .csproj files, while resync synchronises the changes back before regenerating. I know how to disable warnings. But how do I set protobuild parameters? I literally open protobuild manager, click on my project and it does this thing. No idea how to set parameters in Protobuild Manager, when I right click my project, I get norrmal browser menu (IE, I think). In your project directory, there will be a Build folder. Inside that there will be a Projects folder. Open up the .definition file for your project in Notepad, Visual Studio Code or Visual Studio and edit it. Erm... what do I change there? Cannot pass it via Protobuild Manager. And these definition files only contain assembly references, not protobuild's command line args. The Protobuild definition files describe your projects; they don't change the invocation of Protobuild, but instead change what it generates. When you open Protobuild Manager, it should generate the projects, and then open up Visual Studio. While you're working in Visual Studio, leave Protobuild Manager open. When you're done or before you want to commit to your repository, hit Save All in Visual Studio. 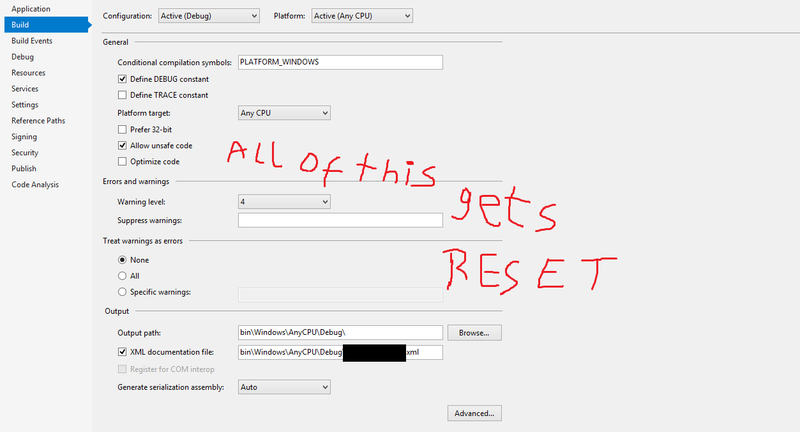 Then in the Protobuild Manager click the "Sync Now" button. That will save the changes back to definition files. Whenever you open Protobuild Manager it will generate by default, so if you forget to hit Sync Now after saving changes in Visual Studio or before closing Protobuild Manager, just double-click Protobuild.exe in the project folder instead and that will resync by default. It's then safe to open up Protobuild Manager again. The --generate / --resync advice applies if you are running Protobuild from the command line. Protobuild Manager doesn't open VS for me and it only have Re-Sync and Sync Only buttons. Try installing the latest version of the Protobuild Manager from the website - I did some fixes a couple of days ago. They don't get synchronised automatically.